It's May in South Florida and that means we've said goodbye to our Snowbirds and welcomed summer weather. 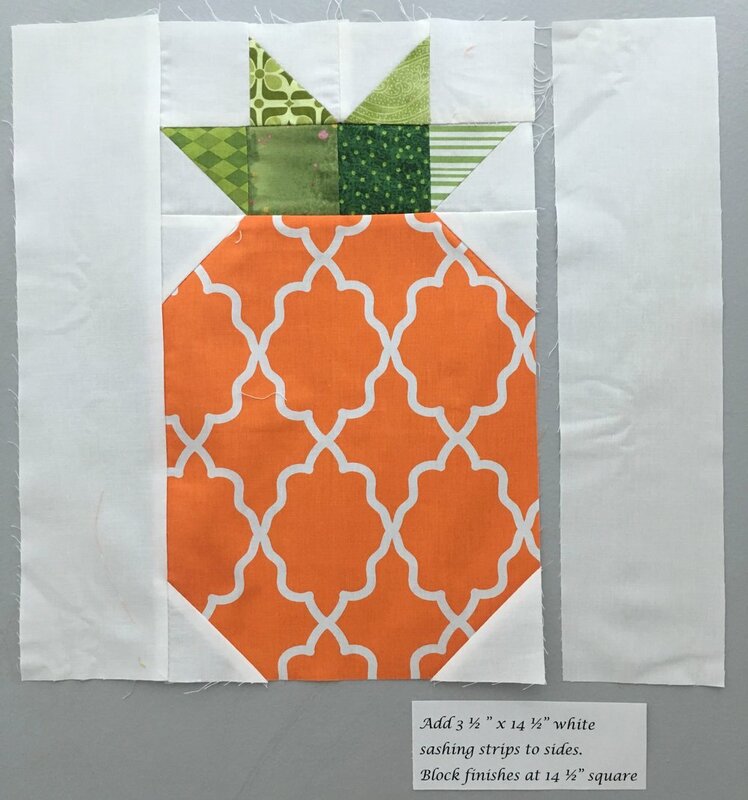 Pineapples are refreshing in heat so this month's Block of the Month is just that, a pineapple. 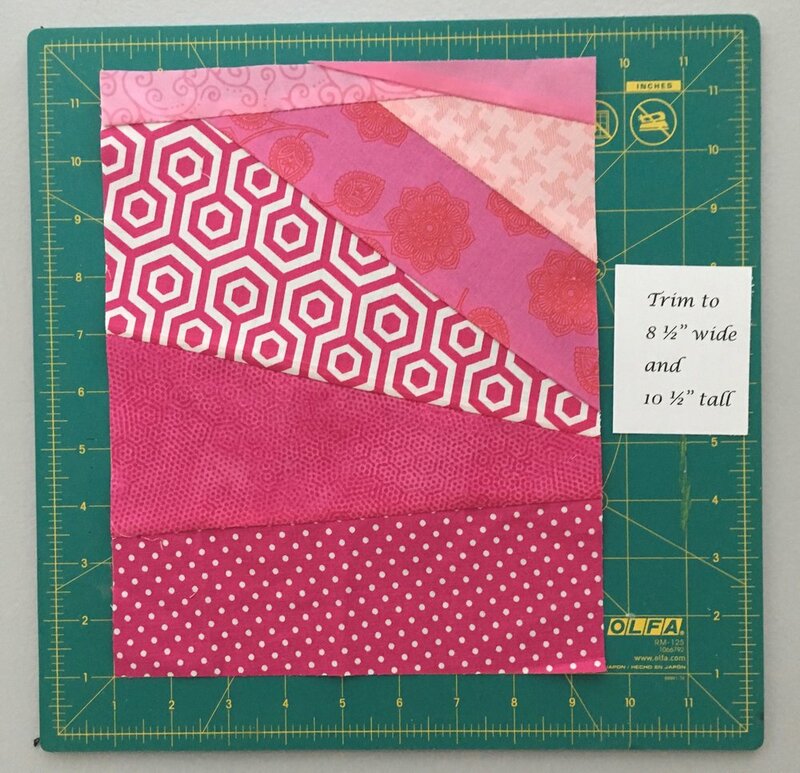 This block has been a huge hit on Instagram and credit for the design goes to Jackie Padesky. If you aren't already following her, please consider doing so. She's gracious and talented! Find her at @jackiepadeskyquilts. For colors, please use a solid white, bright citrus colors for the body of the pineapple and greens for the crown. That means oranges, yellows and pinks (pink grapefruit). Limes are welcome if they contrast with the greens in the crown. 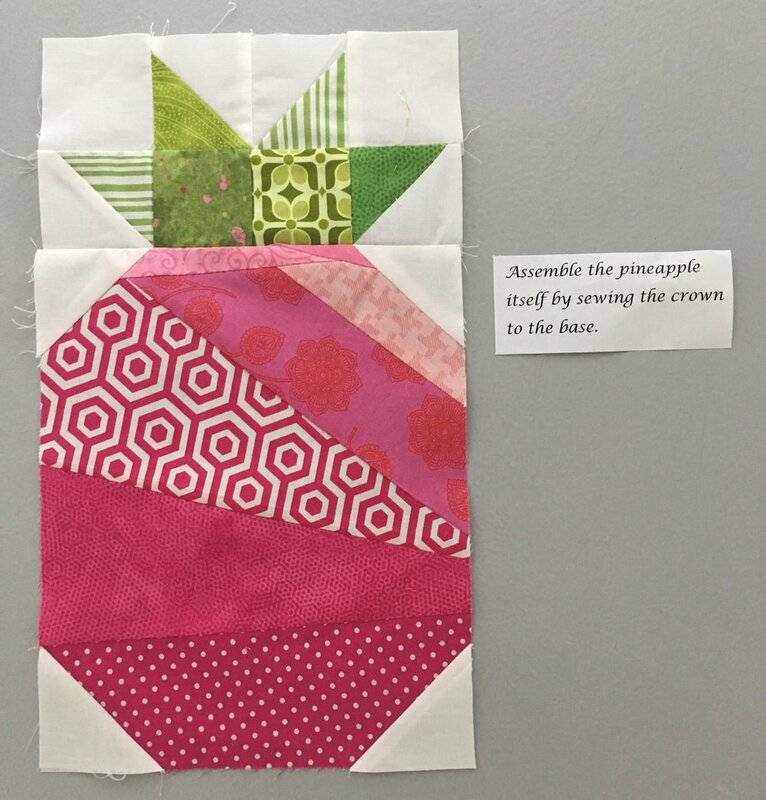 Solids are fine if you're piecing the body. If you chose a single piece body, please use a print. Modern fabrics and 1/4" seams throughout! This is a simple block and it's created in three sections: the body, the crown and final assembly. 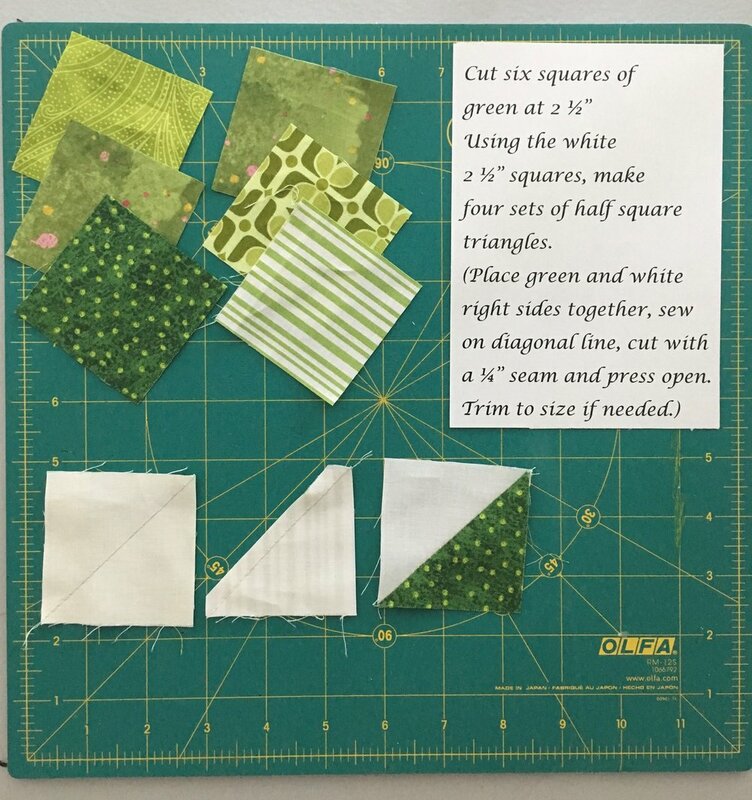 6 2 1/2" green squares - mix'em up! For the body of the pineapple you've got lots of possibilities (see picture above). If you have the perfect piece that says "pineapple" to you, cut it to 8 1/2" x 10 1/2" and go! Feel like improv? 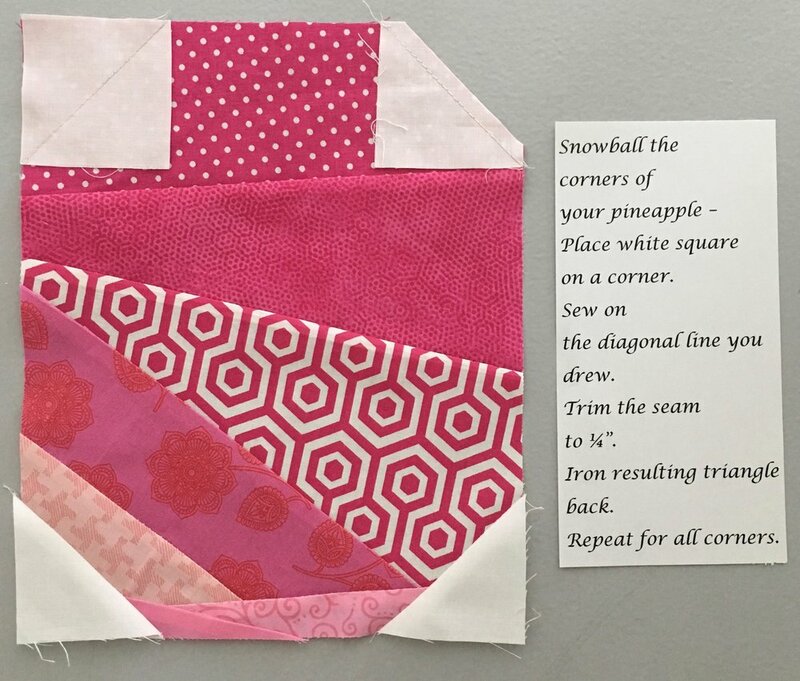 Piece your color choice of scraps together till you get to 8 1/2" x 10 1/2"
The original pattern concept is 2 1/2" squares pieced. It's a little more time but if you feel like sewing, please do! Strip piece something horizontally, or whatever comes to mind. To make the crown, make half square triangles with four of the green squares and four of the white squares. The illustration (third image) shows one way to make them - use your favorite, just square them up to 2 1/2". Assemble the crown as shown in the illustration (fourth image) and then sew the two rows of the crown together. You're almost done - told you it was a simple block! Final assembly is all that we have left. Sew the crown to the body of the pineapple.